Dubrovnik, Croatia - After eight days of heated negotiations, the EU and the 50 tuna fishing nations that constitute the International Commission for the Conservation of Atlantic Tunas (ICCAT) have left Croatia without having adopted any of the much needed measures to stop the massive illegal trade in bluefin tuna and the ongoing overfishing of tropical tuna. A stronger ban on shark finning was once again blocked, putting the species in even greater jeopardy. WWF strongly condemns the irresponsible decisions of the ICCAT contracting parties which continue to allow the depletion of valuable fish resources at the benefit of private and even criminal interests. “The failure of the ICCAT contracting parties to find a united and strong response against criminal and unsustainable activities in tuna fisheries is deplorable. Today’s result will leave fishing and farming companies free to continue smuggling large quantities of undeclared tuna, activities which feed criminal networks and deplete tuna stocks at the expense of consumer safety. The decision to ignore the scientific advice and to postpone by another year any action to address the overfishing of yellowfin tuna and of the already threatened bigeye could seriously undermine the recovery of these species. It’s highly disappointing to see that there is no serious political will to guarantee the full legality and sustainability of these fisheries”. The original EU proposal for a stronger management plan, which would have included some new flexibility measures while ensuring species’ recovery and increasing controls, was strongly weakened by ICCAT Contracting Parties from the South and East Mediterranean. WWF does not support the final agreement which now includes flexibility without strengthening control, as this will not deliver more legality and sustainability. The need for such measures was recently underscored by a recent investigation on illegal trade in bluefin tuna, which discovered an international operation worth €12 million per year and involved Spanish companies, French and Italian ports, and Maltese bluefin tuna farms. Moreover, overfishing will continue to deplete bigeye and yellowfin tuna stocks due to today’s failure to adopt an ambitious management plan. The tabled proposal has ignored scientific recommendations, which include a substantial catch reduction for juvenile tuna, as well as additional management measures for major fishing gear to decrease negative impacts on these species. WWF strongly urges the ICCAT Contracting Parties to agree on science-based management measures by the next meeting in November 2019. In the meantime, we encourage the EU and other fishing nations to take voluntary actions to urgently tackle the overfishing of bigeye and yellowfin tuna. Significant concerns remain over the future of endangered sharks following the lack of agreement on a “fins attached” policy, which would stop the current practice of catching sharks, cutting their fins and discarding them back to the sea to die. On the same line, no measures were adopted to avoid the current overfishing and bycatch of mako and blue sharks. The ICCAT parties that opposed the EU proposal were: Algeria, Tunisia, Morocco,and Turkey. More information on the Illegal bluefin tuna criminal investigation: WWF’s comment and information. ICCAT - The 51 Contracting Parties of the International Commission for the Conservation of Atlantic Tunas (ICCAT) including the EU, USA, and Japan will have their annual meeting in Dubrovnik, Croatia, to agree on fishing quotas and management measures for tunas and sharks. In 2017, WWF criticized the decision by ICCAT to adopt a gradual increase in bluefin catch quotas of up to 36,000 tonnes by 2020.This was the highest total allowable catch ever set for bluefin tuna. Scientists warned that bluefin tuna stock is not yet recovered and is expected to decrease with such a catch level. 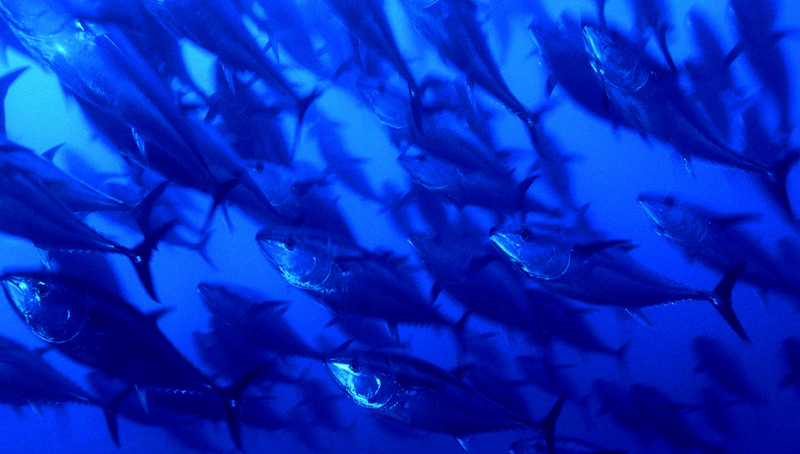 In 2018, the ICCAT scientific committee has suggested the Commission to move from the current recovery plan to a management plan for bluefin tuna, after decades of overfishing. WWF advocates for management measures that will not jeopardise the full recovery of the species. A school of Atlantic bluefin tuna (Thunnus thynnus) during their migration in the Mediterranean Sea.